With the elusive sunny summer days in the UK becoming a rare sight, the city of Palm Springs is encouraging sun-seeking Brits to check out its growing portfolio of stunning poolside hangouts, thanks to its recent hotel additions which have further boosted its enviable repertoire of established on trend poolside hangouts. With the UK summer already proving to be a washout, visiting Palm Springs is a good way to get over the summer blues as it boasts over 350 days of sunshine with 5 only inches of rain in a year; did you read that, 5 inches of rain a year! So where better to soak up the Hollywood playground glitz and glamour than this sun-drenched desert oasis holiday destination. So now that your minds are made up, and you are looking into booking flights, it is time to decide on a hotel. 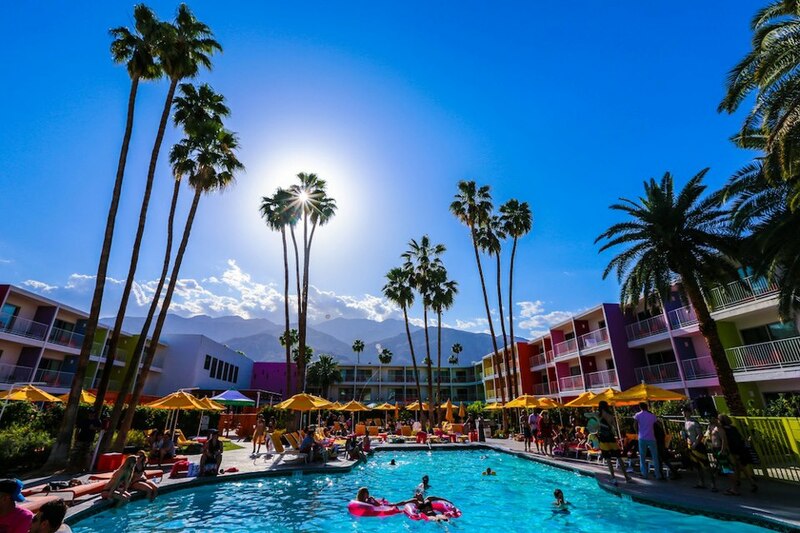 Check out the top trendy Palm Springs poolside hangouts to help you make a decision. 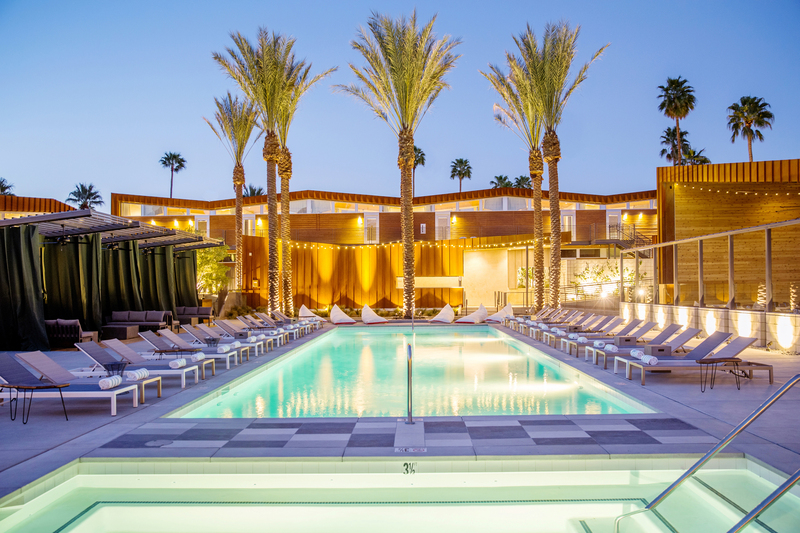 ARRIVE is one of Palm Springs’ newest hotels, known for its chilled out atmosphere, where guests and Palm Springs’ locals relax together around the courtyard pool. With an oversized Jacuzzi, group fire pits with comfy seating, and even Bocce ball, ping pong and a homemade ice cream shop to enjoy, guests seamlessly become part of a quintessentially laid back Californian experience. The latest addition to the Palm Springs scene is the V Palm Springs, with the new Poolside Elixir Bar & Grill, offering guests the perfect chance to sip cocktails by the brand new pool, with the option to enjoy some food from the Polynesian-inspired menu. The bar’s founder and chef, Greg Grossman, recommends trying the bar’s two most popular cocktails, ‘Cucumber Crush’ and ‘In Love with the Cacao’, as you relax and unwind on a sun lounger by the water! Another new prospect in Palm Springs, Monkey Tree Hotel, is a 16-room boutique property tucked away in a private corner of north Palm Springs. 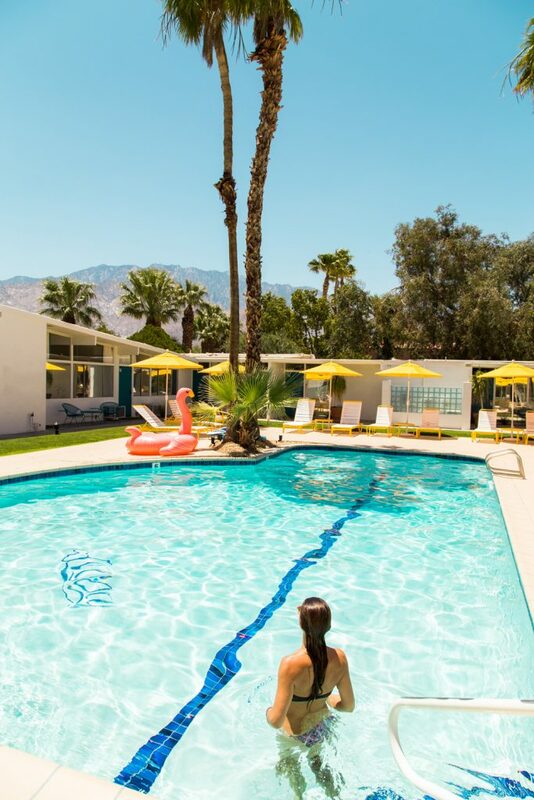 One of Palm Springs’ beautiful Mid-Century Modern hotels, it celebrates its design through its décor and vibe, and boasts a large pool stocked with oversized floats. Guests can take advantage of the Scandinavian spa when they’re not relaxing on the sun beds, with hot and cold plunge pools and a sauna. When not soaking up the sun, they can enjoy breakfast and sangria throughout the day at the hotels vintage lounge, for the ultimate in holiday relaxation. Once named ‘One of the Sexiest Pools in the World’ by Travel and Leisure Magazine, this hotel boasts two exceptional salt water swimming pools. The Moroccan pool wows with an infinity edge and roaring fire pits along the side, whilst the Mediterranean pool provides a light and airy experience with whitewashed villas and stone paths. The poolside experience at the Korakia Pensione is enhanced with daybeds, yoga, tea and breakfast all by the water’s edge, so guests can unwind completely from the hum drum of the regular nine to five. Ideal for a romantic getaway in the sun, not only does this hotel offer an exceptional outdoor restaurant, the Purple Palm, five feet away from the pool, but guests can also stay in the casitas, tucked away with private patios, outdoor lounge beds and bathtubs for two. Whether you’re enjoying a poolside brunch, or floating in the water whiling away the days in blissful heat, this hotel provides complete relaxation and privacy. 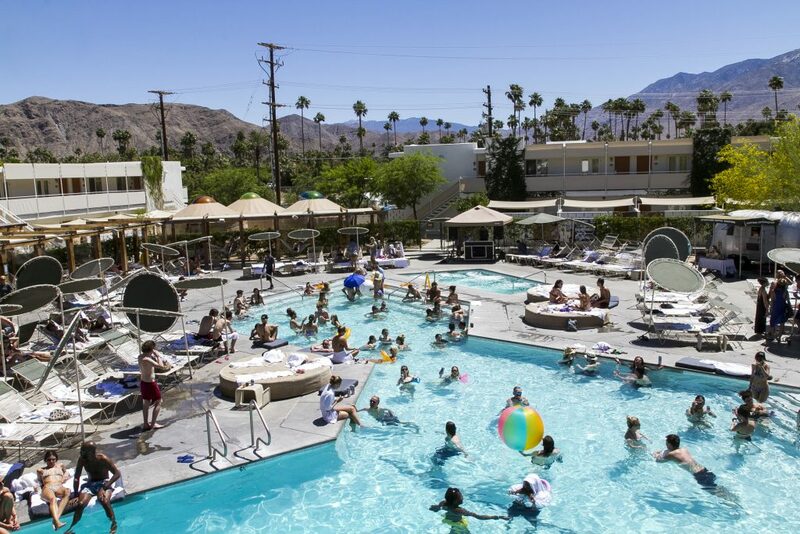 One of Palm Springs’ most popular locations, the poolside scene at this hipster hotel is nonstop all summer. The Ace regularly welcomes exceptional poolside DJs, bands, and acoustic sets throughout the summer. The hotel is famed for its unmistakably colourful décor, and the pool is no different with yellow umbrellas and hot pink towels. 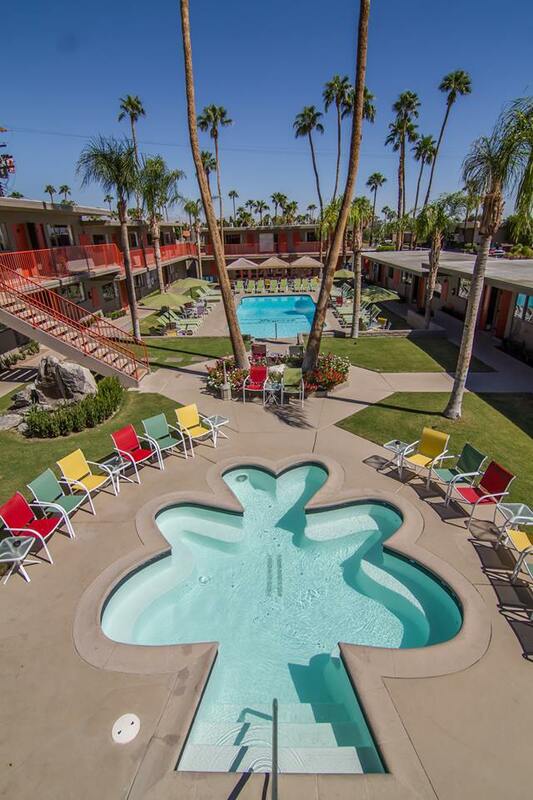 This 1950s gem is one of a kind, and guests can enjoy the party with live DJs every weekend. The relaxing atmosphere at Riviera Palm Springs is perfect for those looking for a more relaxed pool party vibe. Live music, upscale poolside fare at the Bikini Bar and an array of more than 50 rums and tequilas are ready to meet anyone looking for an upmarket time. This high end hotel hosts its ‘Sunday Funday’ throughout the summer, with DJs and special parties for holiday makers looking for a high class pool party.